Walk to the 'World's Safest Beach' from this beautiful, furnished Beach Home and enjoy the white sands and mild ocean surf that put Carpinteria on the map as a great family resort town. With views of the ocean, the new Salt Water Marsh Reserve and the scenic Santa Ynez Mountains, the 'Beach House ' is the perfect location for long term or short term rentals. Easy drive to Santa Barbara wine tasting vineyards, downtown Santa Barbara shopping, night life, dining, sailing, fishing, music festivals. A convenient place to stay for Carpinteria's Avocado Festival, Carp's Triathlon, Santa Barbara Cancer Run, Carp's Surf' n Suds Beer Festival, Rods & Roses classic auto show, Carpinteria Seal Nookery, Santa Barbara Polo Cub matches, Carpinteria Surf Camp, Carpinteria's Farmer's Market, tours of Carpinteria's Orchid Farms, Santa Barbara Sea Glass and Ocean Festival and many other events. This classic home has two bedrooms and two baths and is decorated with comfy charm a ala Pottery Barn. The spacious kitchen seats eight and has a real antique stove you can cook on plus an oven/second range. Walk upstairs and enter the family room with cathedral ceilings and lots of bright sunshine with views all around. Both bedrooms have king size beds with roll away beds in the closet and the sofa in the living room opens up to a queen size bed. Large enclosed backyard with barbecue and sitting area is great for entertaining. Outdoor shower is convenient for rinsing off sand after a day at the beach. You can walk to great shops and restaurants downtown or hop on a train to Santa Barbara for the day, depot is four blocks away. Cute attached unit nicknamed 'The Sugar Shack' features granny style attic cottage with sleeping area for unexpected guests during peak season months. We DO NOT allow pets during the summer weekly rentals. However, we are pet friendly in the off-season. There is a $150 non-refundable pet fee to cover the cost of pet related issues, ranging from poop sweeps of the backyard, cleaning of the carpets, garbage barrel accidents, etc. Our family found this vacation spot by accident after spending fun summers in San Diego and wanting a place closer to home. A friend recommended Carpinteria. We tried it once and fell in love immediately. We spent a few seasons renting and finally decided we wanted to buy a place and make it our own. One of the nicest aspects about living in Carpinteria is that it is flat so walking is easy and biking is even better. There is also a cute little public trolley in town that takes you all around for 50 cents -- what a deal. I love the monthly Flea Market at the local Carpinteria Museum. My favorite purchases are antique jewelry and purses. They also have beautiful flowers and vintage housewares. The pizza at Giovanni's is the best anywhere and so is the local ice cream store on Linden. It's fun attending all the local activities hosted by the city. Small town charm is so hard to come by these days. And if you want a taste of the big city, then Santa Barbara is conveniently only 15 minutes north of Carp and wineries in the Santa Ynez family are an hour away. You have the peace and quiet of a small town but access to great museums, restaurants, theater and shops if you want it. Our guests love surfing, swimming, kayaking, and fishing at the beach. Others prefer skateboarding at the park In Santa Barbara or renting tandem style bikes. Still others prefer rock climbing, hiking in the local mountains. Adventurous ones schedule boat trips for whale watching on the ocean or visiting the Channel Islands which leave from the Santa Barbara Harbor. While at the Beach House the first thing you notice is that you are walking distance to the beach, the salt water marsh preserve and to downtown Linden Avenue. We take the big beach wagon in the garage and fill it up with chairs, cooler, umbrella, boogie boards and take off to the beach. Afterwards we return to take outdoor showers and enjoy the backyard for a barbecue but first cocktails on the upper balcony watching beautiful sunsets or taking in the gorgeous mountain views on the back side. Cooking on the antique stove in the big kitchen that seats eight is fun -- so is discovering treasures in the 'Sugar Shack' the original structure to the Beach House built by the settlers that came out to Carpinteria from the midwest. Sometimes we take the train to Santa Barbara, the depot is two blocks from our house. Many out of state guests enjoy the fair weather the area has to offer during the off-season. When it's cold and snowy in Canada or elsewhere in the United States the gentle weather locally attracts tourist who enjoy off-season rates and no crowds. One bathroom upstairs with tub; one bathroom downstairs with walk in shower. We also have an outside shower great for summer use; rinsing sand off the beach visits. Easy walking distance to downtown shops, restaurants, campground. Upper Balcony offers partial view of the ocean. Two sofas, one a queen and the other a love seat. Antique stove features working cooktop. Second range offers baking and cooking as well. Completely stocked with flatware, drinking glasses, plates, etc. Large kitchen area seats 8 at table. Nice big table with seating for 8. The Beach House is what you want...clean, cute, charming, close to the beach, and very, very comfortable. Love the location to town and the fact that you can use bikes to tool around as well as a great beach wagon to haul chairs, umbrellas, towels, etc. Best part is coming home at the end of a beach day, taking an outdoor shower and relaxing on the upper balcony watching beautiful sunsets with a glass of wine. This is our favorite place in the whole world to visit. It’s really our winter home. The house is comfortable, wonderfully furnished and stocked, and within walking distance of anything you need. You can start the morning on the beach and end with a sunset. We love Carpinteria’s eclectic and relaxed vibe, and we can’t believe we have had the good fortune to experience it for so many years from the Beach House. Charming and very well appointed for any type of activity. The house was everything we hoped for and more. Very welcoming (complete with holiday decorations and welcome goodies) and comfortable space close to everything in Carpinteria. We really enjoyed our time there celebrating with family. The house is great, block from the beach, close to restaurants. Very clean. Highly recommend. Liked the location, close to beach and town. Liked the front porch and the backyard. This is our third time so I guess you could say we enjoy this house. It is so well furnished with everything. This year we enjoyed the wagon in the garage so we could take everything to the beach plus our 18 month old grandson. The only thing we would have liked were some hand towels in the bathroom. It's a great place to stay. Hope to be back next year. Everything We Needed & More! We needed a gathering spot for my daughter’s destination wedding, close to Lions Park, with beds to accommodate immediate family. The BEACH HOUSE hit all the marks and then some. Plenty of sleeping options (think I counted 10), great gathering spaces (kitchen, living room, backyard). The ‘granny suite’ is rather funky attached shed, but could work for adventurous couple or kid space. (but carpet in bathroom is unappealing). Garage was excellent floral prep shop, two refrigerators were great for keeping reception dishes chilled, and the bikes were an added bonus for quick runs to shopping & restaurants or to cruise to the beach for well-earned breaks from wedding prep. 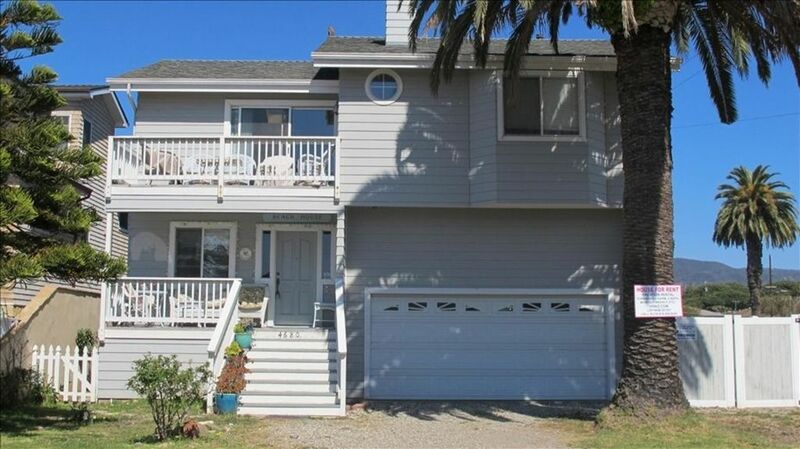 The Beach House is great for a group or family and conveniently located in one of my favorite beach communities. It’s a place I would definitely recommend for a leisurely kick back visit with all the comforts of home. Guests enjoy visiting many local wineries in the Santa Ynez Valley or in downtown Santa Barbara on the wine trails, or casually tasting wine in our local restaurants. NO pets during summer weekly rentals. Pets allowed in off season with prior approval. No smoking at any time. HOLIDAY RATES: $2,000 weekly for a party of four at Thanksgiving, Christmas, New Year's, Easter, Spring Break; $2,500 for parties over four. $350 holiday nightly rate for a party of four; $400 holiday nightly rate for parties of five or more. UCSB graduation weekend: $350 a night for party of four; $400 for a party over four, same for October Avocado Festival. Monthly rentals do not include utilities (electricity, gas, water, cable/internet, etc.) which must be paid for my tenants. Owner pays for gardener. Security deposits on stays more than one week is $500 per week X's the number of weeks of the stay. Monthly rentals do not include utilities which are billed separately and include water, power, gas, cable tv/internet, trash fees.